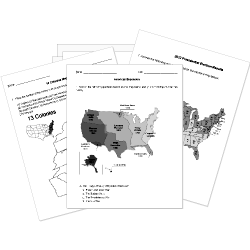 You can create printable tests and worksheets from these Grade 9 Civil Rights questions! Select one or more questions using the checkboxes above each question. Then click the add selected questions to a test button before moving to another page. signed the Civil Rights Act into law. guaranteed the right to vote to all U.S. citizens. prohibited racial segregation in public schools. defined sexual harassment as a form of unlawful gender discrimination. recognized flag burning as protected under the First Amendment. On August 28, 1963 Dr. Martin Luther King, Jr. delivered his "I Have A Dream" speech from the steps of what Washington D.C. location? Jackie Robinson was the first African American to play major league baseball. W.E.B. Du Bois created the N.A.A.C.P. Where was Malcolm X assassinated? What event helped MLK rise to prominence? Who was a former black slave that was very outspoken in womens rights?